As the world continues to get overtaken by civilization and more jungles turn to concrete, there is something about seeing mountain looming in the horizon that reminds us of the true, everlasting beauty of Mother Earth. Towering above the world, covered in snow, asymmetrical yet perfect in every way, mountains silently proclaim dominance over even the tallest skyscrapers. Take a swim through this list of the top 10 most awesome lakes in the United States and let us know which ones you’ve been to! 1. Lake Tahoe | California & Nevada – There’s a reason Lake Tahoe was so beloved by Mark Twain. Accented by lush forestry, breathtaking mountain sunsets, and endless blue skies, this two million year old lake needs to be near the top of your travel bucket list. Hit up South Lake Tahoe on the Cali side during the summer if you want to get a little rowdy. 2. Lake Pend Oreille | Idaho – This list could be filled with all Idaho lakes and it wouldn’t be wrong. Idaho’s largest lake is one of the state’s top tourist destinations. The 100-plus miles of shoreline is dotted with quaint towns, marinas, campgrounds, and plenty to enjoy. 3. Flathead Lake | Montana – Boating on clear water, fishing trophy-size trout, gorgeous mountainous scenery. What more could you ask for? An island inhabited by wild horses, bighorn sheep, bald eagles, and deer? Yeah, Flathead Lake has one of those too. 4. Lake Chelan | Washington – Five minutes on the Lake Chelan visitor site and you’ll be planning a trip there. As the site says, the “crystal clear, glacier-fed lake” boasts “four-seasons of activities” including wine tasting, mountain biking, golfing, shopping, skiing, sky diving, ziplines, waterparks, and more. 5. Lake Mille Lacs | Minnesota – You can’t have a list about lakes without including the Land of 10,000 Lakes. This lake is perfect for any fishing enthusiasts. Lake Mille Lacs is not only one of the best ice-fishing spots, but is widely considered a top destination for bass fishing. It’s also large enough for chartered fishing trips. 6. Crater Lake | Oregon – Who doesn’t want to swim in the remnants of a collapsed volcano? Crater Lake, formerly Mount Mazama, is the deepest lake in the United States. Take the scenic route around the lake and be prepared for the breathtaking beauty. 7. Newfound Lake | New Hampshire – If you ask the New Hampshire tourism board, Newfound Lake is the cleanest lake in the world. As it turns out, a lot of travels would agree. The lake is often described as crystal clear, tranquil, and less busy than comparable lakes. 8. Priest Lake | Idaho – No matter the time of year, Priest Lake is an ideal vacation spot year-round. With fantastic boating, camping and swimming in the summer, and cross-country skiing, and snowmobiling in the winter, you’re bound to have a blast. 9. 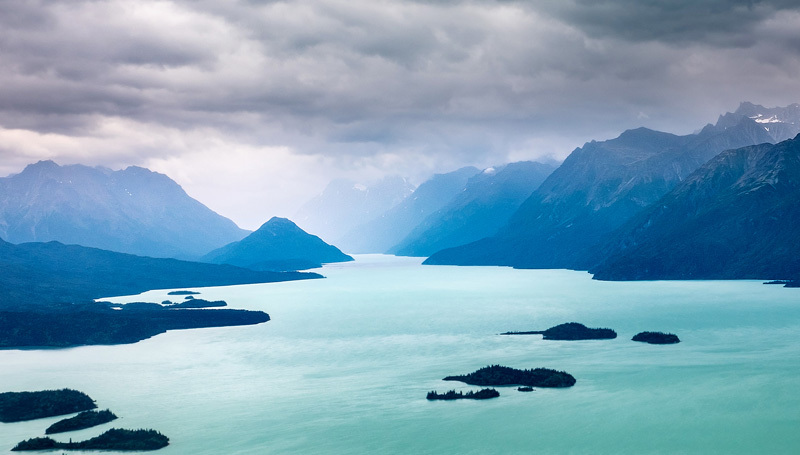 Lake Clark | Alaska – This Alaskan lake is for the travelers seeking adventure. Those aching for a more active trip filled with fishing, kayaking, multi-day hikes, deep woods camping. Reachable only through plane, dogsled, or on foot, the secluded Lake Clark is surrounded by breathtaking mountain peaks, thick forest, and whitewater rivers. 10. Lake of the Ozarks | Missouri – Nicknamed the “Magic Dragon” from it’s unique serpentine shape, the Lake of the Ozarksis a top summertime destination. Enjoy a thousand miles of shore lined with rustic cabins, tons of family activities, and as much boating and water fun as you can imagine. The Great Lakes – Gas up your convertible, grab your passport, and road for the road trip of a lifetime. The Great Lakes are Huron, Ontario, Michigan, Erie, Superior (or HOMES if you’re studying for a geography test). The region, which ranges from Minnesota to New York and up to Ontario, Canada, features many wondrous sights including beaches, islands, picturesque harbors, sand dunes, as well as Niagara Falls, Chicago, Cleveland, and Toronto.